Dakota says that her more active friends have been looking for a dog food to give them more energy and found that a high protein diet has helped. In this article, we will deep dive into why high protein dog food can help and when it doesn’t. She said her friends found that high protein dog food benefits more than just active dogs. They also found that there were more benefits to a high protein diet than just energy. Do You Want The BEST High Protein Dog Food? Below she discussed what kind of benefits exactly her friends have been getting from eating High Protein Dog Food. 1.1 What are the Benefits of High Protein Dog Food? 1.2 Who Benefits from a High Protein Dog Food? Dakota says she talked to some of her friends and found out who was benefiting from the diet and how. Some of her friends were benefiting for specific reasons and some were just enjoying the overall benefits of a high protein diet. What are the Benefits of High Protein Dog Food? There are many benefits to high protein dog foods. It helps with healing wounds, making skin and coats healthier, and it supports the immune and nervous systems. Who Benefits from a High Protein Dog Food? Diabetic dogs can benefit from this type of diet because proteins are easier for them to digest in place of other high carb ingredients. Make sure when picking out a dog food for your diabetic dog that you pick one out for their individual dogs. Puppies and active dogs both require a high protein dog food diet to aid in building muscle. An active dog can be defined by the many different Active Dogs, or it could be a working dog. Lactating dogs need a high protein diet to aid them in producing better quality milk for their puppies. Older dogs benefit from high protein because it helps keep muscles in shape, it’s easy to digest, and it helps their immune system stay healthy. Dakota says that she has talked about the differences in these proteins before in her article about Low Protein Dog Food. She says that she doesn’t care about what kind of proteins she is eating, but some of her friends prefer the better proteins. To know that your dog food has mostly good proteins, check the bag for the first few ingredients. The first ingredients in a dog food make up the biggest percentage of the dog food. The more good proteins, the better. Dakota says that not all of her friends benefit from eating high protein dog food. Below she will discuss who doesn’t benefit from this diet and why. Dogs with kidney or liver problems actually benefit more from a Low Protein Dog Food diet. It helps keep these organs functioning better. A high protein dog food can cause your dog to have trouble digesting the food if they have kidney or liver issues. A high protein diet has been claimed to weight gain, however some disagree on that matter. If you are looking for a low protein diet for your dog, check out our other article discussing the Low Protein Dog Food. Dakota says what she discussed in this article is based on the overall benefits that high protein dog food can bring to your pet. Each dog is different and has individual needs for their foods. Make sure when buying a high protein food to feed your dog the correct amount of dog food they need per day. Dakota says talk to your vet if you are unsure what kind of dog food is best for your dog. Dakota says these are some of the high protein dog foods that her friends have recommended to her. Below she listed which dog foods they recommended and what information you may need to know about each brand. Earthborn is not only dedicated to creating a healthy dog food, but also to protecting the Earth. They have done a few things to try and reduce their impact on the earth such as reducing the size and weight of their packaging, using renewable resources to create their dog food, and using recycled materials to make many of their products. 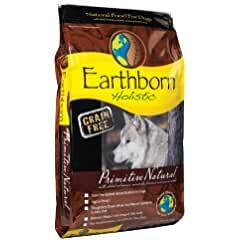 This Earthborn Holistic Primitive Natural dog food is created without any type of gluten and also has a protein content of 38%. 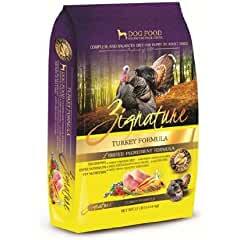 The top three ingredients used in this dog food are turkey meal, chicken meal, and potatoes. It also contains different types of fruits and vegetables such as peas, blueberries, spinach, and carrots. The kibble size is small so that dogs in all stages of life can eat it. It has been claimed to be about the size of a small marble. For anyone interested in supporting an USA company, this food is made in the USA. Blue Buffalo was first created by the owners of a dog named “Blue” who struggled with cancer. Bill and Jackie Bishop, Blue’s owners, since have dedicated to creating a dog food that would help pets with a wide range of health issues. They dedicated their food to using only the best natural ingredients using either chicken, lamb, or fish as the first ingredient. They strive to set a new standard of healthy food for dogs to help pet parents feed their dogs only the best food. 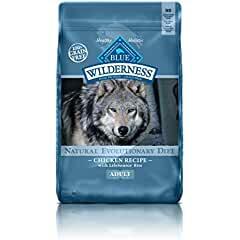 Wilderness Blue Buffalo High Protein Dog Food is a grain free formula with protein content of 34%. Blue Buffalo claims that this recipe helps healthy muscle development, strong bone development, and joint health. The first three ingredients listed for this food are chicken, chicken meal, and turkey meal. The kibble size is small enough for small dogs to eat and has been compared to dimes or small peas in size. For those concerned with very small kibble size, Blue Buffalo also has a small bite formula. This food comes in other flavors than chicken such as salmon and duck. Zignature is one of the brands that Pets Global makes that is extremely popular. This specific food does include quality proteins like Turkey and Turkey meal as the first two ingredients for this food and comes in at 31% protein. The kibble size for Zignature Turkey Dry Dog Food is fairly small and some of Dakota’s friends report they don’t have a problem eating it. Very few dogs report anything negative about this food. It is very unusual for there to be so few negative reports as there is usually one dog in the pack that is finicky enough to turn their nose up. Zignature brands this food as limited ingredient formula, which is usually great for dogs with allergies. They do provide a very detailed list of what each ingredient is and what it’s purpose is. Limited might not be what one might think of in terms limiting the ingredients to a few to avoid allergies. However, the ingredients to appear to avoid many ingredients that have been related to allergy issues. The Zignature site does recommend to not just change cold Turkey (pardon the pun), when changing to this food. The recommendation is to mix their previous food with this one gradually moving from a lower percentage to a higher percentage until you get to 100% Zignature. Users report that the Use By date is approximately 6 months out when they receive their bag of dog food. Nature’s Variety is a company based out of St. Louis Missouri and has manufacturing out of several facilities through out the United States. 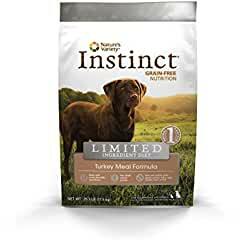 Dakota Says Nature’s Variety Instinct Limited Ingredient Diet Grain-Free Dry Dog Food is made for her friends with delicate digestive tracts. The Limited Ingredient Diet (LID) part doesn’t mean the ingredient list is short (just under 50 ingredients). What it does mean that this product is made using only one primary animal protein source. For this particular food, that primary animal protein is turkey. This could be good news for your loved one that reacts poorly (allergies, digestion problems, etc.) to a lot of other dog foods. The protein content percentage is 32% for this dog food. And, the kibble size is small enough for small dogs to bite and chew. We learned while researching this article that a high protein diet has benefits and drawbacks. A very active or working dog might need a high protein dog food. But, less active, possibly older more docile dogs wouldn’t do well. A High Protein dog food diet isn’t for every dog. So, make sure you consult you veterinarian before you make a drastic change in your best friend’s diet. Dakota says that she hopes that her information about high protein dog food has helped educate you on the benefits of switching to a high protein diet.